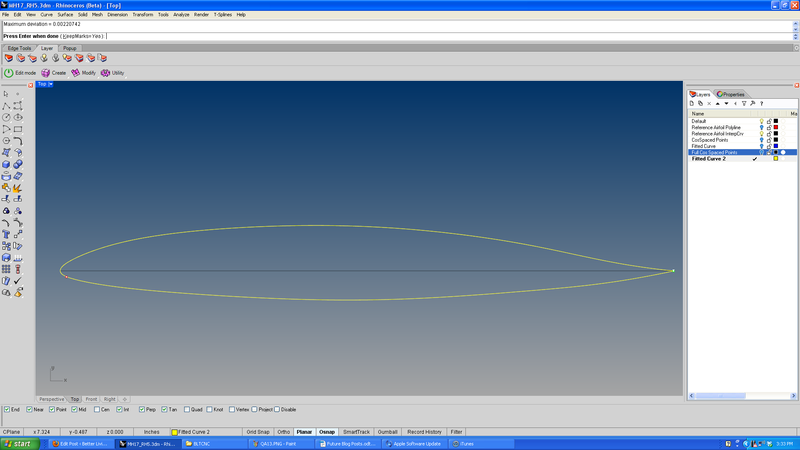 I didnt quite get your ‘before & after’ airfoil comparison. After the fin & stab were extruded & the funky fillet union developed, you then made section planes at various parts of the fin & stab. Then you compared foils at these sections to the original & it was within 5-thou, 1-thou etc. I would have thought these outboard section surface areas would be ‘frozen’ to your foil curves anyway, outside the influence of filleting distortion? ie the only deviation to original foil curves would be confined to the inboard junction areas where you thinned the iso-thingy’s (and there were no section planes through). So what is it really comparing? Within TS, is it possible to see kind of a wave effect change way out in the surface panel based on modifications near the root? 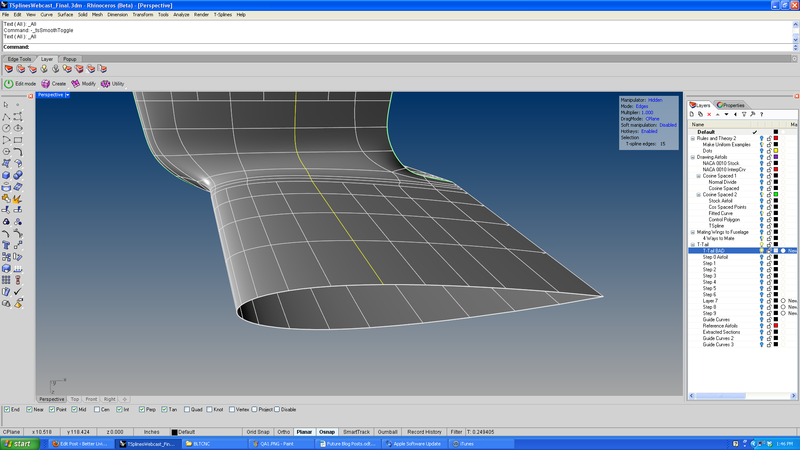 Put another way in the classic clunker cad method: I make a wing panel, a fuse & then develop some fillet between them (it takes me 2 months for teh last bit but thats besides the point ). I would expect funky shape issues within the fillet area, but I would have considered the original wing panel to be locked down, kind of sacred territory. See what I mean? Is TS different in this regard? Do you see how the first two edges have a knot value of 0.5 and the next three have a value of 0.33? 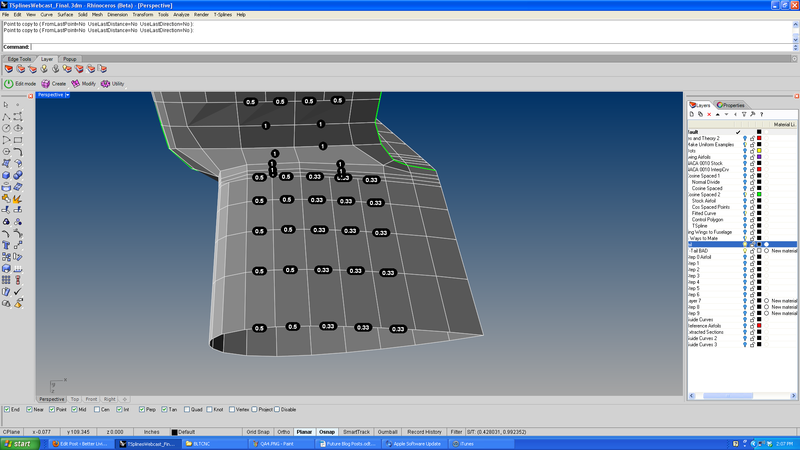 Okay, so we can see how this is caused by bad topology, having three t-points in one section, and two in the other. The higher knot value of the first two edges is pushing the next three edges back a bit, which means that our knots are affecting our airfoil shape. So to answer your question of why this problem persists out to the rest of the span, we have to go back to the simple rule that the knot values must be equal to the edge across from them. Those un-even knot values of 0.5 and 0.33 – they get propagated all the way out to the tip of the span! 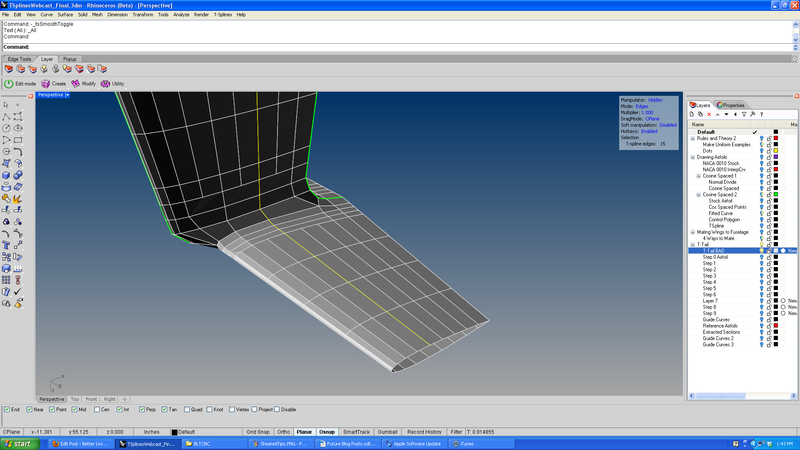 If you look at the model, you will find that every single edge on the airfoils has the same exact value – 0.25. 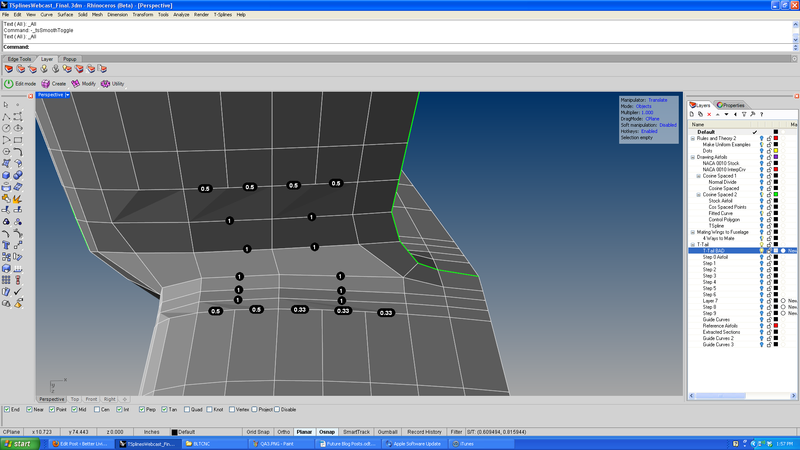 It is the topology that I have used which accomplishes this. 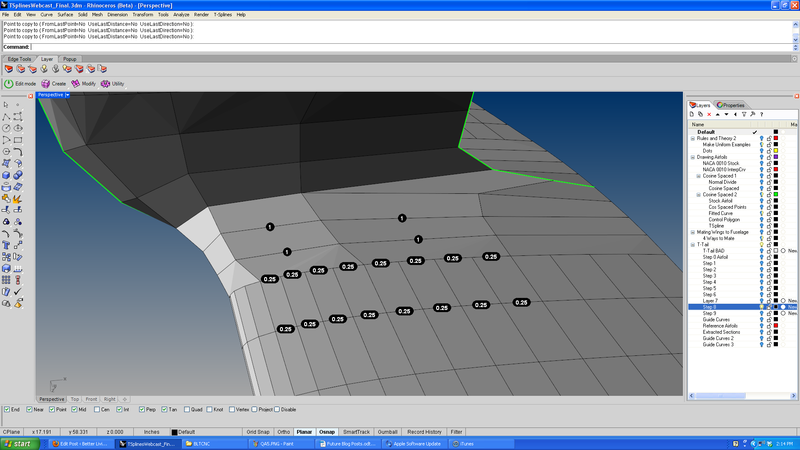 So again, the key to maintaining accuracy in your T-Spline surfaces is to indirectly manipulate your knot values through the use of proper topology. 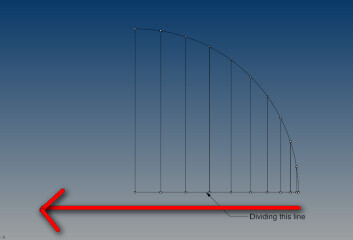 Regarding the cosine half division plugin, Ive attached your blog pic analog. So, when the method is applied to an airfoil curve, is the (my red sketched) arrow showing the nose-to-tail orientation as applied to your semi-circle analog? Is the x-axis chord reference line first divided up into cosine based spacing & then vertically extended to intercept the foil curve? Or does the cosine method divide along the foil curve itself & you are just demonstrating how the resultant x-axis intercepts would look? For a typical semi-sym (racing airfoil) how would you go about subdivision so as to preserve the unique properties of the upper & lower curves which may have reflex, camber etc? ie their deviation is related but not really mirroring each other in terms of where the deviation occurs. Related to the cosine method, is it a ‘one-way’ density distribution that basically subdivides more heavily on one side & then decays off towards the other? Where Im going with this is: for a typical semi-sym (racing airfoil) the upper & lower curve deviation are not necessarily related or mirroring one another as in your Naca sym example due to reflex & camber. So I would expect the baseline mapped deviation curve to flare up again near the TE vs showing kind of muted & non-eventful on the typical ‘near straight’ Naca. Take this racing foil for example, the funky TE kick-up stuff you want to get right also occurs near the TE. So one would want tighter datapoint cluster here like the LE nose area, no? Tackling the first part of those questions. Yes, the idea in general is to have more points at the leading edge where they are needed, and fewer at the trailing edge, where, in general, they are not needed. The picture I used to demonstrate this was mostly to introduce those who had not heard of cosine spacing to the general concept. It is not to imply that the CosSpacing plugin divides up the chord of the line and then projects those divisions – no, the CosSpacing plugin divides the curve directly along its’ length. 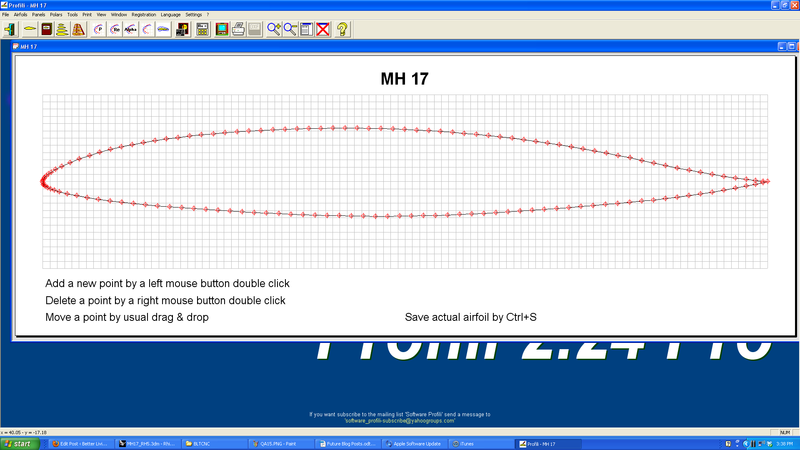 Let’s go through cosine spacing the MH 17 airfoil and see how my method works. ptxman’s concern is that there will not be enough point density at the tail of the airfoil to adequately describe the cusped region. I have taken the MH 17 airfoil out of Profili and imported it into Rhino. My chord length is 36″, and in Profili I gave it a non zero trailing edge thickness of 0.01″ I’ve moved that input file to a layer called Reference Airfoil Polyline and then deleted all other layers. For me, .012″ is too much error, I’d like to keep it smaller than that. There’s no rule against point editing this curve though, in fact one of the main points I make about why you do it this way is that you CAN point edit it if need be. So let’s tweak our points a little and see where it gets us. Now our max deviation is .0047″, which is below what I would usually find acceptable – .005″ This deviation occurs at 0.28″ forward of the trailing edge, which is at 99.2% of chord. If this was an actual wing with say, flaps or ailerons, that would probably be the least of your worries. But let’s say you’re not satisfied with that – now what? Well we have two options. The first is, just use more segments for your cosine spacing. If you’re using T-Splines, as I outlined in previous posts, you should use a power of 2, so you can certainly bump it up to 64 segments. So that’s option one. What if, instead, we used full cosine spacing, instead of half? 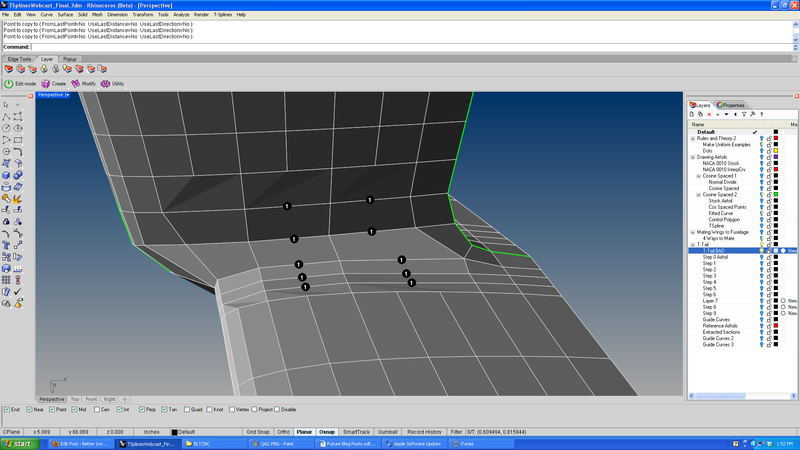 That would put clusters of points at BOTH the leading and trailing edges. Let’s try that! So there are multiple ways you could tackle an airfoil like this, but the general concept of cosine spacing still holds true. 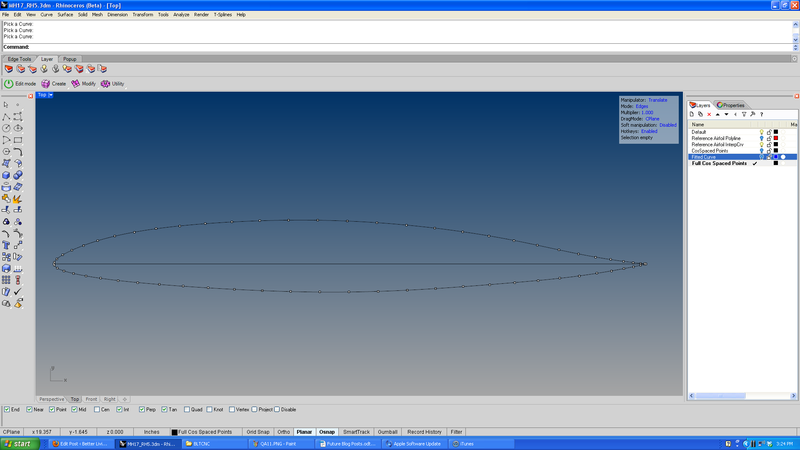 The specifics of each design need to be weighed in considering how to properly draw your airfoil. Whether you need full or half cosine spacing for your top and bottom curves is a function of several factors – just how much cusp there is, how big your chord length is (error will scale DOWN with smaller chords in absolute terms), whether there will be a control surface etc. At the end of the day though, if you are using T-Splines, 32 segments is 32 segments. 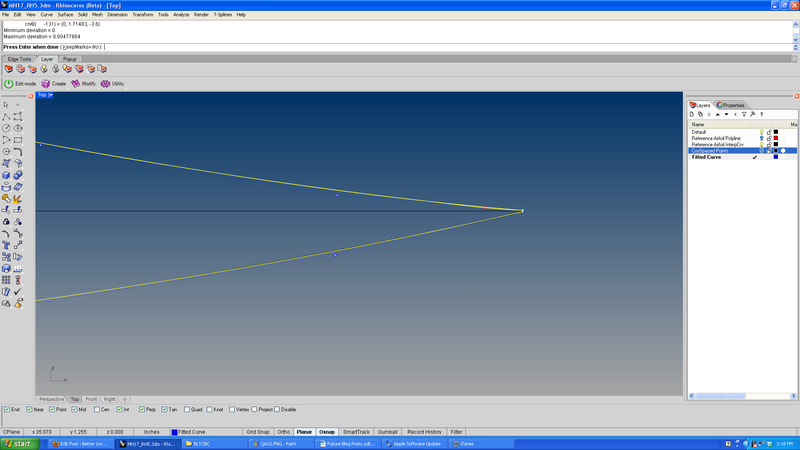 Your blend topology will be IDENTICAL whether you full or half cosine space your airfoil. So I say, go with the one you like the best. You can download the MH 17 Rhino file used for this discussion here. Just subscribed to your blog – found your post on the Homebuilt forum! I’m interested in the convergence of CAD, Aviation, and moving things forward with new technologies. Look forward to learning more!